Gore Wear's C3 Windstopper Leg Warmers feature windproof and water repellant GORE® WINDSTOPPER® fabric for additional protection -- without additional bulk -- when the weather turns a bit nasty. 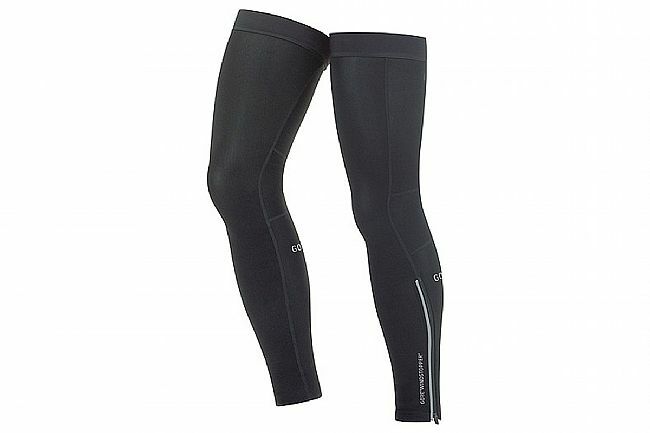 Unlike other options out there, these leg warmers are extremely breathable so they won't cause overheating. Flat-lock seams, pre-shaped knees, and elastic at the top and bottom cuffs ensure a soft, snug, and stable fit. Zipper with semi-lock slider for fuss-free use. I have a 32 inseam and weigh 170 lbs, barely got the things on they were too tight. Gave them to the wife who is 40 lbs less same height, damn things wouldn't stay on. They worked to keep out the chill, but actually cut into my thighs during the ride.